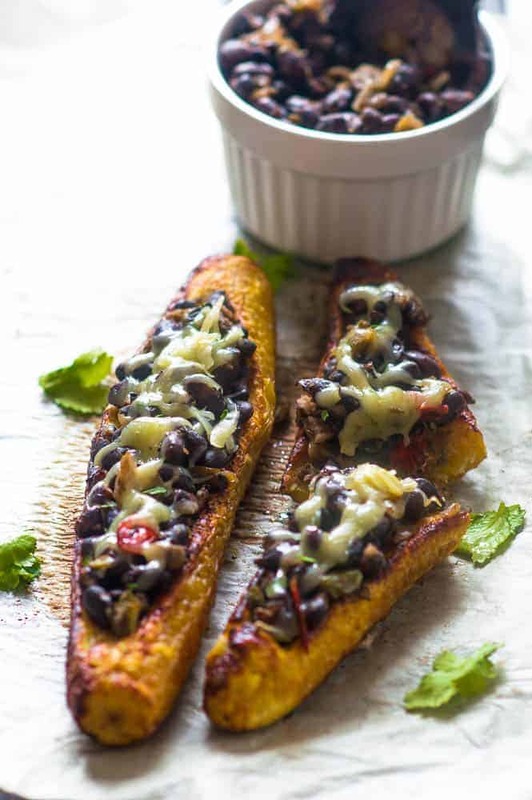 Stuffed plantains – Whet your appetite with some oven baked sweet plantains stuffed with seasoned black beans and sprinkled with vegan cheese. When it comes to starchy foods I would say that plantain is probably the most contemporary of them all. Around 10 years ago, unless you came from a part of the world that consumed plantain, most people wouldn’t be too familiar with what a plantain actually is let alone canoas. If you look at the paleo lifestyle you will notice a trend of starch enriched fruit/vegetables, most of which derive from the tropics .ie Africa or the Caribbean. Plantain is my favourite fruit that is classified as a vegetable, they are so versatile – eat them extra ripe and sweet to the taste or savoury where the skin is green and make tostones. You will be amazed at how many ways you can prepare some plantain with a different degree of sweet or savouriness to suit. 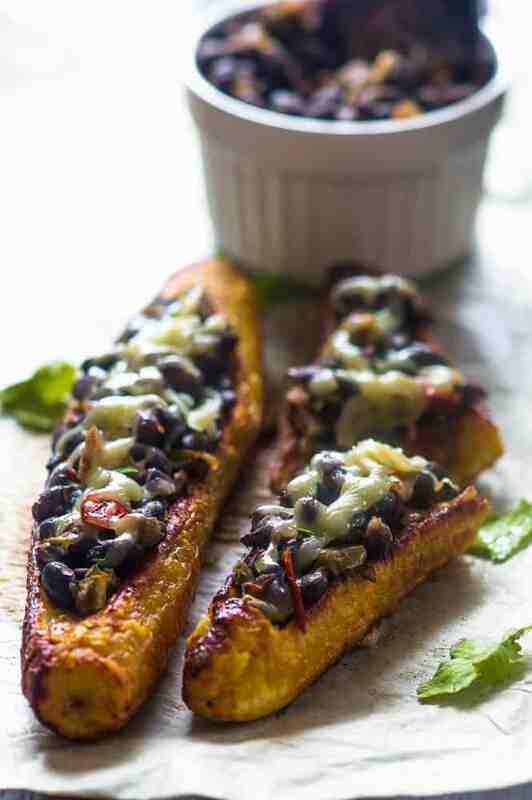 This stuffed plantains recipe is more on the sweet side, it’s actually a vegan rendition of a Puerto Rican stuffed plantains cuisine called Canoas which means canoe in Spanish. Alternatively, it’s also known as canoas de plantano maduros . The original version uses ground meat as the plantain filling, however in my case I thought it would be nice to jazz things up a bit for my vegan readers and dedicate this wonderful cuisine to the plant based audience. With that being said, you do not need to be an avid plant based enthusiast in order to enjoy stuffed sweet plantains. I want people of all dietary requirements to over indulge. All after it is free from gluten and made using vegan cheese so what more could you ask for? To prep the filling if you’re in a hurry simply use canned black beans rather than boiling the dried ones. One can of beans should fill up to four plantain boats. The black beans are seasoned to true Latin American style using bell peppers, black pepper, onions, garlic, oregano, parsley and cumin. When purchasing the plantain, you’re looking for plantain that is firm and more of the yellow side with few dark spots. If the plantain is too ripe, it will be too sweet and mash when preparing to stuff. I kept the recipe as healthy as can be by baking the plantain as opposed to doing it the traditional method which would be frying. The aim was to eliminate as much fat content as possible and by boiling it you can saving all that grease plus it taste the same anyway. Another quick note when carving out the inside of the plantains be careful not to cut too deep, you only want to cut deep enough to scoop out the inside to accommodate the filling. Line a large roasting pan or baking sheet with parchment paper and set aside. Meanwhile, add 1 tablespoon of coconut oil to the frying pan and melt on medium heat. Once melted, now add the garlic and onions and sautee until translucent. Then add the chopped bell peppers and cook until they are softened. Season the sauteed ingredients with the parsley, oregano, black pepper, cumin and salt to taste. Make a lengthways cut down the length of the plantain, all the while being mindful of NOT cutting too deep and scoop out the inside so the plantain now resembles a canoe. Repeat this step with each plantain until complete. 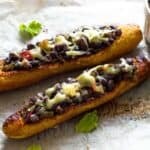 Spoon the black beans mixture into the canoas (canoes) and top with vegan cheese. It’s been ages since I’ve last had the chance to visit your website. I’m working too hard…actually, so hard, I don’t cook anymore. I buy them fried on campus – Yummy! Those look so good! I don’t need vegan cheese, but with any cheese that is an exceptional dish! Thank you so much Mimi. I hope you make it! !